We hope that you find 2009 to be a very happy, healthy, and prosperous year! Take a look at the content in the Outlook Reading Pane. The highlighted document in the list above it is actually in the Companyweb\Shared Documents folder back in the office. 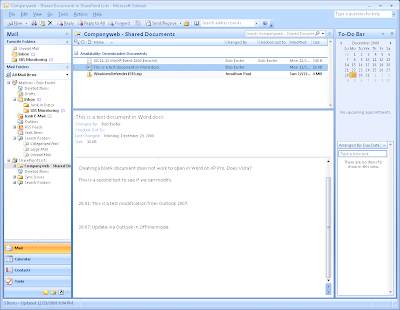 The edit to the Word document was accomplished by opening it through Outlook 2007 that is connected back to SBS via Outlook Anywhere (RPC/HTTPS). We opened it in Offline Mode, and edited the file while in Offline Mode. Keep in mind that if there will be a need to edit files in Offline Mode, they should be checked out for the duration of those offline edits. Outlook 2007 plus the SBS 2008 Companyweb Internal Web site certainly demonstrates a very powerful reason to upgrade. Things operate very smoothly between them. Time savings can be another reason to consider an upgrade for a small company especially when the cost for support runs over one hundred dollars per hour. When Office 2007 is installed on a workstation in an SBS 2008 network and Outlook is fired up for the first time, it picks up the user's setup via the server. Yes, okay, Outlook 2003 does that too. But, Outlook 2007 actually goes one step further and picks up the Outlook Anywhere settings (RPC/HTTPS) and puts them in place for us. There is at least a couple minutes of time saved, one possible post Office install step the tech can no longer forget, and thus a support call that has been avoided. It is one less step on that setup checklist. SBS 2008 - Windows SharePoint Services Considerations Plus Not One Recycle Bin, But Two! One of the primary reasons we did not move too many of our client's primary data storage onto the Companyweb site in the SBS 2003 time frame was the lack of an ability to recover those "accidentally" deleted items. The catch for us implementing WSS V3 on SBS 2003 was the inherent limitations of the 32bit OS that was already loaded down with a number of different SBS related and third party related services. Thus, we only implemented in a limited number of client settings where WSS would be used, but not cause too much additional stress (especially RAM related) on SBS 2003. With SBS 2008 and the WSS v3 product that drives the new Companyweb Internal Web site, we are seeing a whole new opportunity. We can utilize the out of the box Companyweb on SBS 2008 to a great extent and not worry too much about RAM or database limitations for our small to medium sized clients. We have the flexibility to tie Companyweb and any other WSS based Site in an SBS 2008 Premium based installation into SQL 2008 which will give us a lot of headroom when it comes to site performance. Tying SharePoint into SQL 2008 also alleviates much of the data volume concerns we have had to date ... though both site performance and database sizes will be tied to the physical server box's configuration. Have a client that wants to have an Internet facing WSS v3 site? Then SPLA the Windows OSs needed and SQL 2008 Web Edition for them as that will put their licensing costs at dollars per day depending on the end configuration as opposed to licensing SQL 2008 Web Edition per processor on Open Value or Open License which is very expensive. The user has deleted the document, and it now sits in the Recycle Bin waiting for them or someone else to delete it. If there are a large number of items in the bin, clicking on the item selection box just above the first item's check box will select everything. Okay, in our above screenshot, once deleted from the Recycle Bin where does that document go? Of course, the User Recycle Bin is empty because the user has already emptied it. Now, there was a momentary lapse of reason on the user's part and they now realize that the file that was deleted from the Recycle Bin was still needed! Not to fear! 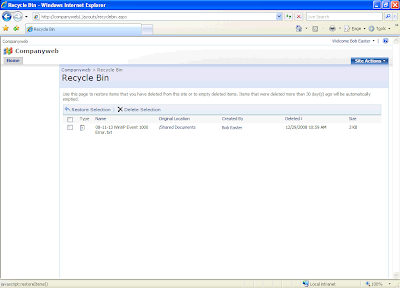 We now have a Recycle Bin's Recycle Bin! Not only that, when we restore that file, it goes back to its original location on the Companyweb site, not back into the User Recycle Bin. 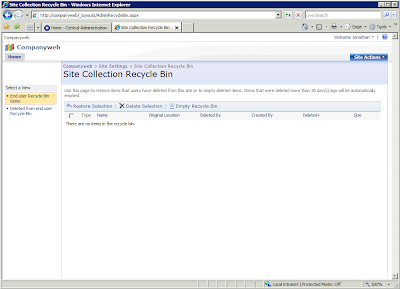 BTW, it is important to note that the Recycle Bin system in WSS v3 also works when the user is using Explorer View to work with site content. This one feature will save us a huge amount of pain over "lost" or accidentally deleted files on the Companyweb or any other WWS v3 site we manage on behalf of our clients. Microsoft Service Providers License Agreement (SPLA) site. Since we have been so busy, there has been little time to catch up on things happening in the Microsoft Partner Portal. Note that the screenshot is from the Canadian Microsoft Partner portal site. Eligibility for this benefit is offered to Action Pack or Empower Subscribers, Small Business Specialists, and Certified and Gold Certified Partners. There is another incentive to get out and obtain the Microsoft Small Business Specialist designation for a small I.T. shop! Business Critical Support is a good insurance policy. It should never be the first line of support when something hiccups. That is where the SBS ecosystem such as our SBS peers, online newsgroups, and other sources of SBS knowledge come into play. For the most part, most current Intel server products support Windows Server 2008 and thus SBS 2008. For an up to date list, check out: Server Products: Status of Server support for Microsoft* Windows Server* 2008. Note that server board S3000AH shows "In Progress". We do have our SBS 2008 Blueprint Springer Spaniel's SBS 2008 running on that platform with an Intel Xeon 3070 Dual Core CPU, 8GB Kingston ECC, SRCSASRB RAID controller, 320GB Seagate Enterprise SATA in a RAID 1+0 array, all mounted into an Intel SC5299DP server chassis. That box has been in "production" since late August and has had no issues whatsoever with SBS 2008 RTM. We had some issues with SBS Cougar Beta, but they were primarily due to driver compatibility with the young OS and one of the Seagates developing some bad sectors. As always, test things out and run at least a 72 hour burn-in on the server before allowing it out into production. 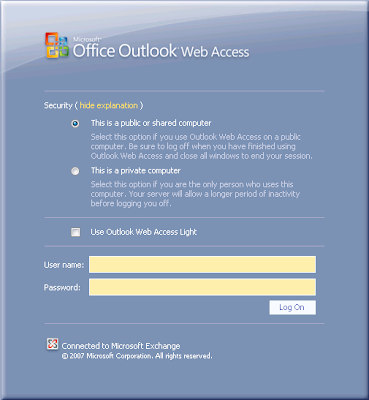 The new Outlook Web Access (OWA) based on Exchange 2007 SP1 that we get with SBS 2008 is such a huge improvement over OWA in SBS 2003. There are so many new client-side features that greatly improve a user's e-mail communication efficiency as well as their overall experience using Outlook Web Access. Having the Deleted Items Recovery tool in the Outlook application when Exchange integrated is an administrator's life saver! Once a user has been shown that they can recover their deleted items, they take full advantage of it. Now they can do so via OWA. They no longer need to establish a connection to a dedicated Remote Desktop to recover an e-mail, wait until they get back to the office to do so, or call us to help them out. The time between a Windows Mobile device has been discovered missing and its being wiped by an administrator via Exchange 2003 can be absolutely critical ... and long. With Exchange 2007, the user has control over the device. If the user's mobile device is somehow lost or stolen, they can remote wipe their own device quickly via OWA. There is added security for Windows Mobile 6.x devices as the users would have turned on encryption for their add-in storage cards. So, barring any possible signal blocks or a dead battery, the device will wipe itself and any data on the card would be "lost" too. These two features make SBS 2008 along with Windows Mobile device integration that much more attractive for clients with highly mobile workers. SBS 2008 - RWW and OWA Idle-Time Caveat or Hiccup? The new Remote Web Workplace in SBS 2008 is pretty phenomenal. In our opinion, tying the new RWW features into the ability to publish Terminal Services RemoteApps is pretty much a "Killer App". There is however, a hiccup, or caveat we have noticed between RWW and OWA. When a user uses RWW to authenticate and then clicks through to Outlook Web Access (OWA) via the Check E-mail button, they may get bumped out of OWA after 30 minutes of inactivity in the still existing RWW tab or browser window. Given the amount of time we spend working on our e-mail communications, 30 minutes is not unheard of when it comes to a user's being focused on the e-mail tasks at hand. Essentially, while in the middle of working in OWA 30 minutes after connecting via RWW, the user will click on a button and be presented with the Exchange OWA log on page. Now, if once the user has opened the OWA tab or new browser window and they turn around and close the RWW, the time-out hiccup does not happen. If the RWW page was indeed closed, it seems to be that the Private Computer idle settings apply. This behaviour has been pretty consistent so far, so we have been mentioning to client users that if they plan on only using RWW to access their e-mail, that they should use the direct URL instead. Any SBS domain joined workstation or laptop will have a Check E-Mail link in their favourites. For any non-domain joined workstation or laptop, we ask users to log onto RWW and click through to OWA and bookmark that page. The SBS 2008 OWA direct URL is: https://remote.SBS2008.ca/owa. Intel Associate Members - Demo Advantage = Get your Extreme On! Well, given the current exchange rate for the Canadian dollar to the United States dollar, it means close to 50% off our cost via distribution. The setup will make a nice demo rig for those who need high horsepower setups for their own business. For those of us that have been working with SBS 2008 in production or in labs, one of the noticeable things is the tightening up of security in Internet Explorer a la Windows Vista. Now, as a rule, browsing the Internet while at the server console, or remotely connected is a no-no. To put it another way, browsing the Internet from a server should never happen. For those of us that manage small SBS installations where there may not be a free desktop to remote into in the first place, this can be a bit of a challenge ... initially. But, stop and think about what SBS based tool we have to use to facilitate the ability to never browse the Internet from the SBS console or remote desktop? The answer to the above question is the Companyweb SharePoint site. The catch to that answer though, is not the client's Companyweb! Try and upload a zipped driver file to the SBS 2008 Companyweb at a client's site or in the Lab setting. When we right click on the file and download it to a local directory then try and extract its contents we will get an error that the archive is empty! Download the file via a secure desktop within our own shop. Zip the file, files, or a folder. Post the zip archive to our Companyweb site. Use the direct link on the client's SBS server to connect to our Companyweb: https://remote.mycompany.com:987 for SBS 2008 or https://rww.mycompany.com:444 for SBS 2003. Navigate to the zip archive. Extract the zip archive once the download has completed. Now, this is the process we use for about 95% of any needed files from the Internet. The other 5% are things like service packs and other large files that we will need to download directly from the manufacturer's site. Note that most Microsoft Updates will appear in WSUS, so we generally do not need to download from their site. Once we have finished our own migration from SBS 2003 to SBS 2008, we will have a dedicated SharePoint site along with the SQL back end for this purpose. We hope that 2009 will be a prosperous one for all of you! Just as the title asks, should we keep the SnapShots feature? The service was originally thought to be something that would be helpful. We have added a poll near the top of the right hand column on the blog. Please take a moment to click through and let us know what you think. Need to test the newest upcoming service pack for Windows Server 2008 and Windows Vista? Keep in mind that this service pack will also be applicable to SBS 2008! If so, it can be downloaded from the TechNet site: Windows Server 2008 Service Pack 2 and Windows Vista Service Pack 2 Beta Customer Preview Program (CPP). We will get a backup just before the attempt too ... just in case. Note that the combined x86/x64/IA64 ISO download is close to 1.4GB. Microsoft SQL Server 2005 Service Pack 3 is available for download. Please read the list of bugs fixed with the Service Pack. From there, the What's New in SQL Server 2005 SP3 document discusses what additional features and/or abilities have been added to the product. There is a different Service Pack for SQL Server 2005 Express: SQL Server 2005 Express Download Page. Note that there is a request to register for the download, but there is a direct link to the download for those who may not want to registered. Also, as of this writing the download for SQL Server 2005 Express still links to the Service Pack 2 version. There is no word on the SQL 2005 Service Pack 3 being released via WSUS from what we can see yet. The current root view is Program Files. Each Program Files sub folder is defined by a border, in this case the yellow one, with each grouping within it indicating more sub folders. 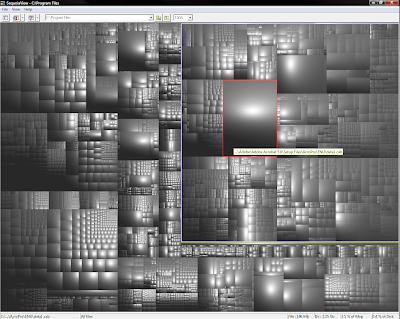 Each unique square visually represents a file. The larger the square, the larger the file. The screenshots in this post were pulled from the XP version of the utility running on Windows Vista Ultimate x86. We have yet to test it on an x64 OS. This utility is definitely one to have on the Technician's Thumb Drive! We needed to replace one of our ageing HTC PPC6700 series mobile phones due to its reliability heading south. The CDMA carriers up here recently introduced the HTC Touch Pro. It is a Windows Mobile 6.1 Professional phone with a full slide out keyboard. Big thumbs means the keyboard is a prerequisite. It has pretty good reception, though it struggles a bit more in enclosed areas such as a basement or server closet than the old HTC PPC6700 did. The PPC6700 gave warning that things were not working as they should with the way it behaved. The HTC Touch Pro gives a quiet snapping sound in the ear and the call is gone. The high resolution screen is nice. Everything is crisp and clear, though at night there is a noticeable pulsing dim-bright-dim-bright cycle with the back light. So, this particular unit may end up heading back to the store for a replacement. Add to that a 3MP camera that takes reasonably good pictures. Low light seems to cause a bit of a struggle, but that is expected with a built-in camera like this. Integration into our existing SBS 2003 R2 Premium Outlook Mobile Access was quick and painless with the first sync taking under an hour to pull everything down. The Touch Pro is noticeably quicker than the old PPC6700. That is refreshing as the stalls in between tasks on the PPC6700 were painful at times. After adding in an 8GB SanDisk Ultra Micro-SD (Class 6) into the mix, we were good to go. The Class 6 level means the card will transfer data around 6MB/sec. Not nearly as fast as a USB flash drive, but will do in a pinch. Windows Mobile 6.1 Pro has the ability to encrypt the entire contents of the storage card which is valuable for us when we need to move client data about. The Touch Pro has a USB HDD feature that, when enabled, allows the phone to be plugged into a PC and be seen as a USB HDD with access to the storage card. This is a good thing to have because the Windows Mobile Device Center would otherwise be trying to sync with the phone. The Touch Pro Bluetooth integrated with the HHR's in-car hands free system seamlessly. Once out of the car and then back in after a client visit, the Touch Pro recreates the connection with the car very quickly. The PPC6700 needed a call in or out to reestablish a connection with the in-car Bluetooth hands free. All in all, the HTC Touch Pro is a very nice phone that will do the job for us. With SBS 2008, we inherit all of the Windows Server 2008 monitoring goodness. This is our longest running SBS 2008 RTM box. The hiccups the box had earlier were typical for driver and management software hiccups. The above reliability monitor includes all of the recent spate of updates from Microsoft. So far, the server has been essentially bulletproof. What does that mean for our clients and for us? It means that we are seeing successful deployments of SBS 2008 with no need to "wait for that service pack". It means that we can build successful infrastructure solutions based on the new SBS 2008 feature pack knowing that we are working with a stable product. It means that our clients are getting good value for their I.T. dollars. SBS 2008 - Group Policy All Settings Filtering - The cat's meow! Group Policy - All Settings Filtered on "Disconnect"
While the Excel spreadsheets we had of the various policy settings were searchable, they were still very painful to synchronize with the actual ongoing Group Policy editing. That time, while not completely gone, has definitely taken a huge step forwards. While filtering will not work for the Windows Settings node, it will work for any setting in the Administrative Templates node. In this case, we were looking for the Remove "Disconnect" option from Shut Down dialog GP setting to enable in our default SBS 2008 Client Policy Object. We always enable this setting on our SBS networks so that users do not inadvertently disconnect from a workstation while working on it via the Remote Web Workplace. Inevitably, we would receive a support call to have that workstation freed up. Right click on the All Settings node and click on Filter Options. From there, we can define any type of filter we may need to drill down to the GP setting we are looking for. Now, after having a close look at the Filter Options screenshot, go back up to the Settings Filtered screenshot and click on it to bring it up full size. Have a look at what happens when the + was clicked to the left of Administrative Templates. The little filter symbol appears on the folder and we can only click on folders that contain the GP settings we found via the filter as they are the only ones we can see. This Group Policy feature was mentioned at Tech Days. This one learned feature alone more than paid for the two days of training and information. It will be such a huge time saver for us ... and for you! And, we also took the time to delve into the feature in Jeremy Moskowitz's book on Group Policy Fundamentals. Between the two, we are now better equiped to manage our SBS 2008, EBS 2008, and Windows Server 2008 Group Policy settings. You will need a Live ID to sign in. So, what is the big deal with Software + Services anyway?!? There are so many very passionate voices about how good or how bad the S+S model will be for us Microsoft Partners ... especially us small I.T. shops. For us, the equation is quite simple. While Microsoft and others may be able to delve into our client's realm with their products and services to some degree, they do not have the resources to be the face behind everything. For the ultra small businesses, S+S makes sense since there is very little contact with a primary I.T. services provider in the first place. Retail tends to be the only contact when the hardware fails or the software needs to be upgraded. For those businesses that have a Trusted Advisor for their I.T. needs that may also provide the infrastructure components such as hardware and software, the idea of transitioning their payments to Microsoft or other S+S providers may be good sense, or may not be. The key in this equation is the Trusted Advisor. Part of the reason we are trusted in the first place is the fact that we have put our client's I.T. needs before ours. The deeper the business relationship grows and the longer in duration, the more that trust builds between business owner/contact and the Trusted Advisor. This is a natural progression in any relationship. The key to all of this is how to maintain that trust with the business owner. If we do not keep our heads about is, get caught up in the emotional and painful vision of what we see coming (whether that perception is correct or not is another story), we very well could lose that Trusted Advisor status. We need to remember that our clients as small business owners may not be totally technically savvy, but they have a head on their shoulders that is very keenly tuned to the needs of their business on all fronts. That is a prerequisite for a small business owner. We all need to be conscious of all aspects of how our business is doing. If that business owner sees their Trusted Advisor losing perspective on the whole Software + Services situation - remember, the business sense is tingling in the business owner's mind at this point - there very well could be a falling out between the two. In the end, this situation is a lose-lose. The business owner loses because the Trusted Advisor knows their business and can learn how to tie into the new S+S model to meet their business needs. The Trusted Advisor loses a client and may take a serious hit against their reputation and referral business among other pain points. As difficult as this situation may be, we need to delve into discovering just what S+S can do for us and our I.T. services company. We need to see just how we can incorporate S+S into our solutions toolbox to provide the best solution for our client's needs. One of the most difficult lessons those of us that run a small I.T. business need to learn is, "It is not about me". It is about "us". That "Us" is a combination of our clients and the small team of people within the I.T. business (in our case it is Monique, my dad, and myself along with some freelance technical help) along with the vendors and others who support the Partner in their abilities to provide solutions based on their technologies. With the economy doing wacky things, and everything seemingly hanging in a precarious balance, we need to be looking out for the best interests of our clients. If their business is threatened by the current volatile business climate, then we need to be a part of the solution that keeps them afloat. S+S may indeed provide an avenue for that to happen. The other alternative is to sign the SPLA and design solutions around it and the services offered in the Cloud. A fellow I once worked with when very young in my days and ways once told me, "Struggle and Change are Opportunities". I did not get it then, but the saying stuck with me. Today, as a small business owner watching world events unfold around us along with the massive changes happening within our industry of choice, the saying is a huge Pearl. We have an opportunity of untold magnitude lying before us. How things pan out based on how we leverage that opportunity is totally up to us. We have decided to keep Forefront as part of our network protection topology. So far, in our spam protection experiment Forefront Server Security for Exchange is doing a fantastic job of filtering out all of the garbage. To go beyond the trial period and license Forefront Server Security for Exchange SP1, we will be setting up an Open Value Agreement for our clients that do not already have one. The part number is: 9SG-00069. This is the first year part number. If our client already has an agreement in its second or third year, we would either purchase using the SKU for the year, or set up a new agreement depending on what else would need to be licensed. This SKU is for a monthly subscription which is very inexpensive. When ordering from the distributor, the order quantity will be 12 (12 months) per user being licensed. It is well worth the minimal cost per year per user. Need Visual Studio 2008 Pro & MSDN? We have an NFR to give away! We received a full version copy of Visual Studio 2008 Professional with MSDN Library while at Tech Days. The copy is NFR. So, we cannot sell it. Click the link for Blog Questions, leave the subject line, and e-mail us a short blurb about why you should get it and we will mail it out to you. We will pick the best story, in our opinion, and announce it here. If anything, a couple of minutes of your time and you will have a software pack worth approximately $1,000 Canadian. Just got back from the Tech Days event down in Calgary. Vancouver is the last city on the tour January 21 and 22 in 2009. The brain is overflowing with information. Not only that, the creative juices are really flowing due to the large number of product demonstrations and the ideas they triggered. Some myths that I had were busted too ... especially about AppV Application Virtualization (Formally SoftGrid which is included in the Microsoft Desktop Optimization Pack). We had some excellent presenters with more to come on them and their content. For the last Intel Channel Conference we paid for the afternoon desktop build session to work with Intel engineers on their new desktop technologies. The system build was to be a Blu-ray and HD-DVD capable system. No OS was included in the session. We opted for Windows Vista Ultimate x64 SP1. USB based wireless (don't have yet). When it comes to the motherboard, we made sure to install and update all of the relevant drivers from the CD that came with it along with updates via Intel's Web site. For the LG optical drive, we were not going to run with any of the software on the accompanying CD because the OEM version of software products tend to be missing some key component or other that we would subsequently be directed to the software manufacturer's Web site to purchase. Since Windows Vista does not support Blu-ray out of the box, we needed to run with third party. We decided to check out the included OEM PowerDVD product which is version 7 after all. Of course, this is a special edition for the OEM packaged product while CyberLink's site shows version 8 as current. One of the installation options on the LG CD was a utility to check for any firmware updates applicable to the LG optical drive. Given the newness of the technologies in the optical drive, checking for firmware updates was a good idea. The download was somewhere around 6MB in size and a reboot was not requested once installed. Just in case, we rebooted the box. The CyberLink PowerDVD product required an update to 7.3 that was about 103MB in size. Once we had the two updates in place, we ran a Blu-ray of Kung-Fu Panda and it looked astounding on our 22" shop wide LCD. It will look even better when tied into a wide screen LCD television via HDMI which is built into this motherboard. After Toshiba made their announcement that it will no longer develop, manufacture and market HD DVD format discs and the fact that there will be limited new title releases in HD DVD format, CyberLink has decided to remove HD DVD support from PowerDVD 8. However, CyberLink will continue to support and maintain HD DVD movie playback in PowerDVD Ultra (version 7.3). Now, after a bit of research as a result of the above, we came up with this gem from the We Got Served blog: How To: Play Blu-ray and HD DVD Movies from Vista Media Center. We will be purchasing the above software to round out our new home theatre PC. With the economies of the world struggling and in some cases dropping in the tank, we have seen a roller coaster ride of ups and downs for our product pricing. Prices in the distribution channel have only started increasing in the last two to four weeks for us. In some cases, we received price increase warning letters from manufacturers that we are registered resellers for. In others, Synnex Canada has been pretty good about e-mailing us with price increase warnings. Pricing volatility has played havoc on our quoting which we normally allow 30 days for. Lately, we have reduced that to one business week. As a result, we end up needing to buffer the quote up 5-10% (divide not multiply) to cover any immediate increases. If prices remain relatively static, then when the time comes to issue an invoice for the deposit on the project, we will let our client know that we can pass along a 5-10% savings to them due to our pricing levels. The tough spot was about three weeks ago when we saw the Intel Xeon E5440 Quad Core CPUs jump by close to $300 cost per processor and the RAID controller jumping another $150 in cost. Other components in the server build also saw some significant steps upwards in price. We were able to talk to our clients and prospective clients about a compromise on our existing quotes. They understood that the economic situation was making things difficult for us. We ended up absorbing 50% of the cost increase for that situation. Another ouch, but at least they were happy that we took the time to explain the situation and split the difference with them. For those of you in the United States, this situation may not be impacting your business, but for those of us outside of the U.S., we are, in some cases, being hit quite hard with the currency fluctuations. Be cautious in quoting folks. Given the situation in the world, now is not the time to start losing on projects due to missed margins. Are you going to be in Calgary for Tech Days starting tomorrow? I will be barring a massive white-out and driving down becomes impossible. The weather here has been a bit challenging with the snow and cold. This is especially true for those of us that are hosting SBS environments for our clients via our SPLA agreements. For many of our clients that do spend most of their time on their laptops outside the office and connected via RWW, this message saves them from trying to figure out why their Outlook Mobile Access or Outlook Anywhere has stopped working ... at least until they tried to log onto the SBS 2003 RWW and received the change password prompt. This little password warning will save a good chunk of time, both our clients and our own, not having to answer those "things have stopped working" support calls when the user was off-site. While many folks around me seemed to have found out quite a while ago that they had passed their attempt at the 71-653 SBS 2008 exam (note the MS Learning link indicates 70-653), I heard nothing. After talking to someone at Microsoft and Prometric about the results, they indicated that most beta exam results in Canada would not be released until sometime this month. At that time, I had not put any time into the SBS 2008 migration documentation, so I know I messed up on a few of those questions. On the Microsoft Learning site as per the above link the exam number is referred to 70-653. This is the RTM version of the exam. It looks as though the 71- means Beta. The official exam release article: Small Business Server 2008 Gets New Exam. Beta Exams: Microsoft Certification Beta Exams. There are some caveats when working with non-Windows OSs as Hyper-V guests. In the case of the Untangle VM, there is no way to install the Hyper-V Integration Services into the VM. As a result, there is no mouse capture in the VM when opened via the Hyper-V Manager (gives console access) if connected to the Hyper-V management system via a RDP session. For some systems, keyboard shortcuts may suffice to get about the OS and its management features. In the case of the Untangle VM we were not able to do so. Thus, we needed to be at a physical workstation whenever we needed to manage the VM directly. The Untangle product does allow HTTPS connectivity to the machine for management purposes once everything has been set up though. This management will need to be accomplished via a workstation as the security settings in IE on the SBS box will not allow the Untangle management features to initialize. The other caveat when setting up the Untangle product in a Hyper-V based VM is the NIC setup. We set up static MAC addresses for both NICs with the intent of setting the External NIC MAC address up with a static IP reservation in our own SBS server's DHCP. During the Untangle setup routine and subsequently the Untangle Setup Wizard the NICs were reversed. How the setup routine decides which NIC is Internal and which NIC is external is not known. But, once the NICs were reversed in the Interface Management post OS install, the correct Internal static IP was set in place and DNS was set to the SPRINGERS' SBS VM everything fell into place nicely. For the book we were working with version 5.x of the Untangle product. Untangle has just released version 6 of the product. From our conversations with Untangle the step up to version 6 is quite significant. BTW, if you are used to working with ISA and its rule structures, Untangle and its management features should come fairly natural when it comes to the learning curve. As part of our SPRINGERS methodology for our new SBS 2008 Blueprint book, we were able to work with a number of different security vendors while looking at alternatives to ISA 2004/6. One of the vendors we have looked at was Untangle. Their product is based on Debian Linux and is a fairly robust firewall and filtering product. Subscriptions are involved for Active Directory connectivity and more. While the 512MB of RAM is not critical, the fact that the install routine did not find any NICs is a showstopper. 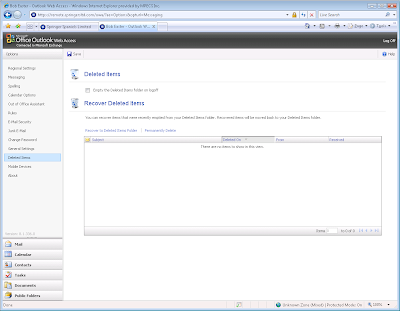 When we setup the VM, we setup two NICs using the Hyper-V built-in NICs. So, we shut down the VM and removed the two Hyper-V based NICs and added two Legacy Network Adapters. We set one of the Legacy Adapters to the SBS 2008 network and one to connect to our internal network (Our ISA server has a rule published to allow the Untangle IP address a direct connection to the Internet along with a DHCP Reservation for the VMs' MAC address). We also increased the RAM to 1024MB (1GB) to eliminate the warning against the amount of installed RAM. After clicking OK in the above dialogue box the VM shut itself down. We then changed the boot order in the Hyper-V manager for that VM to hard disk first, released the Untangle ISO, and powered the VM up. The Office Live Small Business Applications site (SharePoint). The Office Live Small Business Web site. 5 Users for the Business Applications site (SharePoint). Now, the Office Live Small Business Applications may indeed have a place for those small offices that do not have a Small Business Server installed. For those clients that have SBS 2003 or SBS 2008 setup and are utilizing the CompanyWeb site internally and externally the Office Live Business Applications site and its associated costs will not make much sense. This is especially true if their CompanyWeb or additional SharePoint setups have been customized for their business workflows and systems. Essentially, the out-of-the-box setup of the Office Live Small Business Application Web site makes sense for a start up company with no on site SBS server. The Office Live site can be customized to a degree to at least give the company a collaborative starting place on the Web. The Office Live Small Business Web site on the other hand comes with 500MB out of the box. For most small business Web sites, this will more than suffice. The costs to add more storage space are identical to the above Business Application storage costs. One thing to keep in mind: The URL for the Office Live Small Business Web site can be rather long. 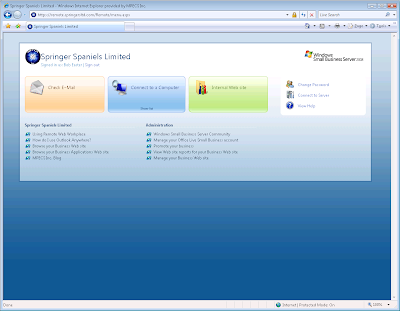 In the case of our Springer Spaniels Limited site the URL came out to: http://springerspanielslimited.web.officelive.com/. 6UA-01804: SBS Standard 5 CAL Pack. 6UA-00908: SBS Standard 20 CAL Pack. 6VA-01260: SBS 2008 Premium 5 CAL Pack. 6VA-01805: SBS 2008 Premium 20 CAL Pack. Note that SBS 2008 Standard comes with 5 Standard CALs out of the box. Also note that SBS 2008 Premium comes with 5 Premium CALs out of the box. No singles were presented to us during our license query. We will need to wait and see for those part numbers. In the case of SBS 2008 Premium, we can combine Standard and Premium CALs. If on 10 users out of a 30 user office are connected to SQL server, then one need only purchase 5 additional Premium User CALs to be properly licensed (we count the 5 Premium CALs included with SBS 2008 Premium) along with the 20 Standard User CALs. Software Assurance has that one support incident tied into it. That is one really good reason to have SBS SA at the client site. Another very convincing argument for Open Value is the ability to have three payments over three years. That helps defer some of the up front costs which may be a factor for clients looking to update their servers but are looking to do so on a budget. SBS 2008 Premium DVD T75-02424, X14-81619. Sleeve: Media Set: X14-81550. SBS 2K8 Server Repair DVD T75-02424, X14-81621. Sleeve: Media Set: X14-81551. SBS 2K8 Win2K8 Std x64 DVD T75-02424, X14-81166. Sleeve: Media Set: X14-81165. SBS 2K8 Win2K8 Std x86 DVD T75-02424, X14-81140. Sleeve: Media Set: X14-81139. SBS 2K8 SQL 2K8 Std x86 & x64 DVD T75-02424, X14-81050. Sleeve: Media Set: X14-81049. SBS 2K8 SQL 2K5 Std x86 D1 T75-02424, X14-83227. Sleeve: Media Set: X14-83226. SBS 2K8 SQL 2K5 Std x86 D2 T75-02424, X14-83284. Sleeve: Media Set: X14-83283. SBS 2K8 SQL 2K5 Std x64 D1 T75-02424, X14-82646. Sleeve: Media Set: X14-82632. SBS 2K8 SQL 2K5 Std x64 D2 T75-02424, X14-82679. Sleeve: Media Set: X14-82665. The above are the specific part numbers to be found on the media itself along with the sleeve that the media came in. We are still waiting for a clear answer on how we will obtain ISA, Windows Server 2003 R2 Standard, Outlook 2007, and SharePoint Designer 2007 along with their install keys. As soon as we know the answer, we will post it. Are you going to be in Calgary this coming Thursday for the upcoming Microsoft Technology Partner Tour? Barring the flu bringing me down, I plan on being there. This would be a good chance to meet Satish face to face since he is relatively new to us in the Canadian SBSC. By the way, if you are a Canadian SBSC and did not receive an invite to the exclusive SBSC Lounge the evening before the event (Wednesday), send Satish a quick note and I am sure he will gladly forward the invitation to you! 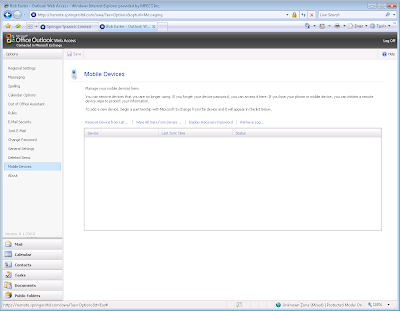 We were in the process of setting up some VMs on one of our Server Core based Hyper-V servers. During the setup process, all of the VMs on the Hyper-V box would go into pause mode. That message was a bit of a puzzle since as far as we knew things were 100% with the Hyper-V box. It was pretty much a new build. It seems that this condition indicates the storage location for the VM files is running out of space: Microsoft TechNet Forums: Virtual machine state: Paused-Critical. Sure enough, when looking at the partitioning scheme and available space, the partition the VMs were residing on was just about full. 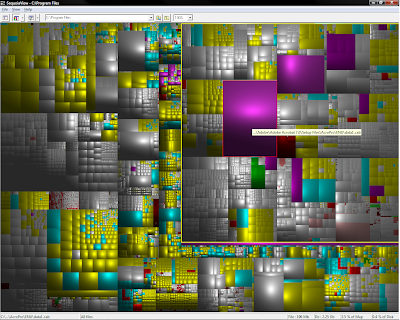 A little partition restructuring was done to fix the shortage of space and the VMs no longer paused. If you enjoyed last month's SBS 2008 Setup Webinar, then please join us tomorrow morning at 09:00AM Mountain Standard for the continuation of that SBS 2008 setup: SBS 2008 Setup Part II: Client-side. We will run through the various Getting Started Tasks, connect a client or two to the SBS network, and run through some of SBS' new features. Please join us if you have the time! Sorry about the short notice, with my being down with the flu, things have fallen a bit behind.